day by day. | there's no place like gnome. 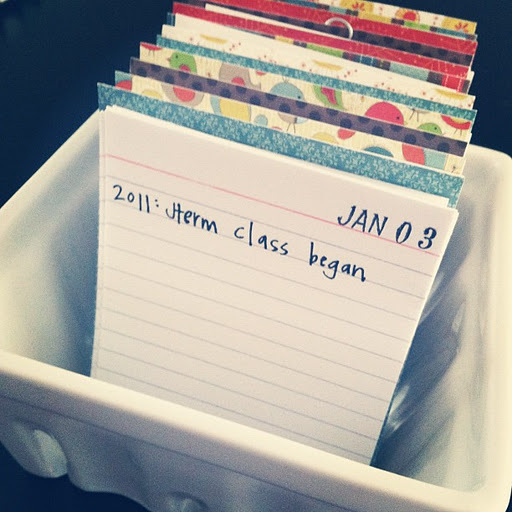 Last year at this time, I assembled an index card daily calendar journal of sorts. [which I learned how to do here.] I chopped index cards in half, labeled each with a day, and put them in order in a box. The idea was that each day, I would write down the year and something that happened that day. [Samples: yoga is good. history test – nailed it. freaked out about 1st call. crabby pants day – uh oh. etc.] I had my doubts that I would actually carry it though. Lo and behold, as we begin a new year, I start the 2012 line on each index card, underneath a 2011 line. It will be fun this year to look back on 2011 and can only imagine what fun it will be five years down the road [if I continue]. I love stuff like this. So fun! I didn't know that's what your cute carton was! This is way easier than journaling and a fun way to remember a year. I'm so up for this!